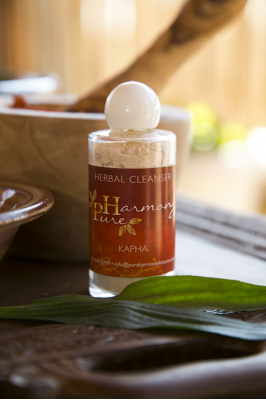 Kapha Herbal Cleanser - 2 oz. Home » Skincare Products » Kapha Herbal Cleanser - 2 oz. Purifying Sandalwood, ritha and turmeric combine to help reduce oiliness and skin congestion, gently exfoliate and leave skin clean and refreshed. Mix a dime-sized amount of cleanser with a few drops of water to create a liquidy paste. Gently massage on the face in a circular motion. Rinse with water. Use morning and night. Follow with appropriate nourishing oil.